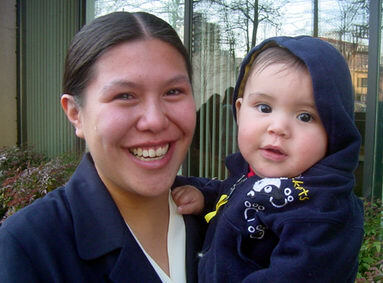 George Manuel Jr. interogated by RCMP, 2004. 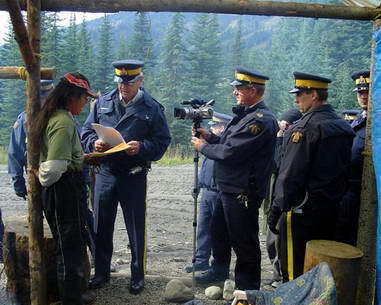 Nesconlith George Manuel Jr. was arrested on his traditional territory at Skwelkwek'welt on 21 September 2004 (above). 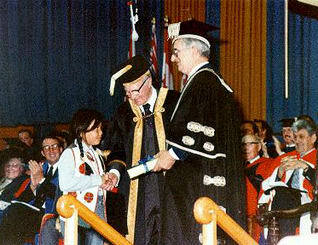 Twenty years earlier, on 26 May 1983, a young George Manuel Jr. had accepted the honorary degree for his father George Manuel, the world leader of indigenous rights, at the University of British Columbia (right). The arrest of George Manuel Jr. by the Royal Canadian Mounted Police reveals how BC politics operate in unlawful disregard of the UN Convention on Indigenous Rights. The corporate abuse of First Nations sanctioned by government occurs on contested Indian land that has never been surrendered or treatied. 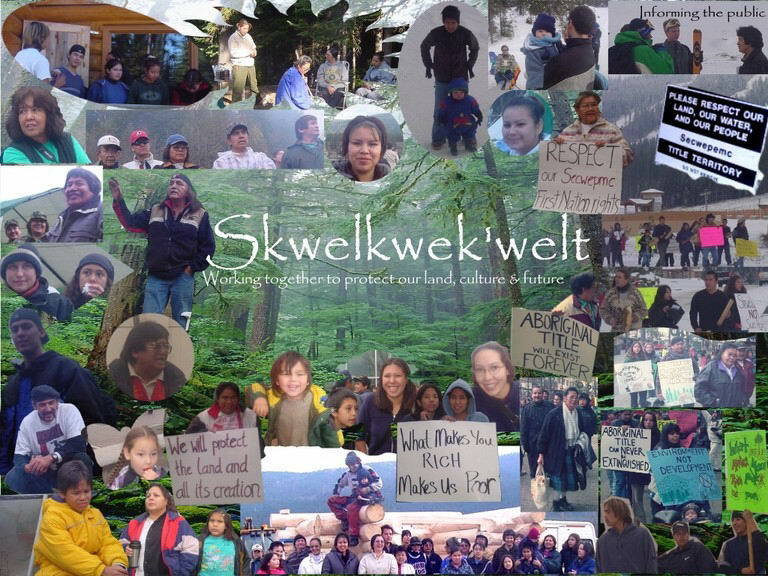 Skwelkwek'welt, the high alpine traditional Secwepemc hunting and gathering ground north of Kamloops, is "hot land," contested Indian land occupied by big business consortiums. 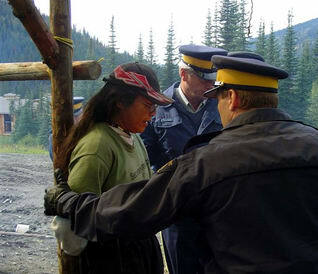 Here government treachery toward First Nations is clearly displayed by punitive police arrests (left). George Manuel Jr., UBC, 1983. 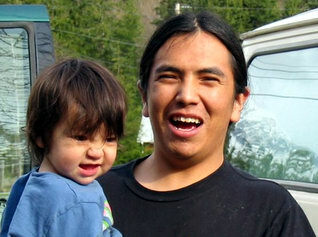 George Manuel Jr. served RCMP injunction, 2004. 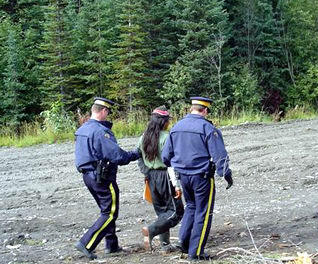 George Manuel Jr. arrested by RCMP, 2004. George Manuel Jr. searched by RCMP, 2004. "We need to realize that the elected chief have not been able to reverse the decision to extinguish Aboriginal Title or have Treaty Rights recognized on the ground. This means that we need to build and expand our forces not diminish them. It is time that full recognition be given the hereditary chiefs and grassroots activists to add to the struggle. We need to double and quadruple the forces we have if we are going to win. All the elected chiefs have been able to get out of the federal and provincial government has been the Nisga'a Final Agreement" Arthur Manuel at a fireside protest, 21 September 2007: Sun Peaks - Indian Land For Sale. The brother of George Manuel Jr. explains why Skwelkwek'welt is such an important stand for indigenous self determination: "Sun Peaks is inside Neskonlith Indian Reserve 1862 and north of the present Dept. of Indian Affairs Neskonith Indian Reserve. Secwepemc people who have been fighting for Sun Peaks to stop expanding are primarily from the Neskonlith, Adams Lake and Little Shuswap Indian Reserves and some are from Kamloops, Skeetchesten and Barrier Lake. These people support the traditional land users." George Manuel Jr. removed by RCMP, 2004. "Where's Your Deed?" 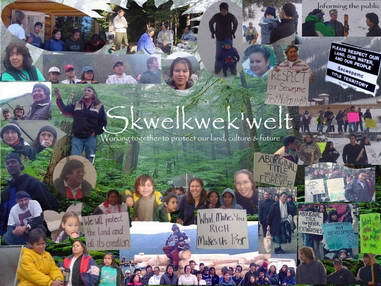 Skwelkwek'welt, 2004. 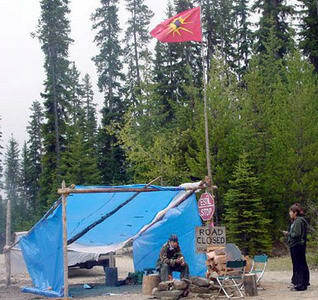 The Skwelkwek'welt Protection Centre (left) was established on 9 October 2000 to oppose the $70 million expansion of Sun Peaks Resort (above) and to defend the traditional Nesconlith Indian Band land which is part of the 1862 Douglas Reserve. "Our faces will be covered because even when we do speak, you do not listen, from the first contact until now, we remain invisible. Why: Sun Peaks Resort Corporation and owner Nippon Cable (a partner of Blackcomb Whistler Resort), continue to expand onto our Traditional Secwepemc Lands without the consent of the Indigenous Peoples." 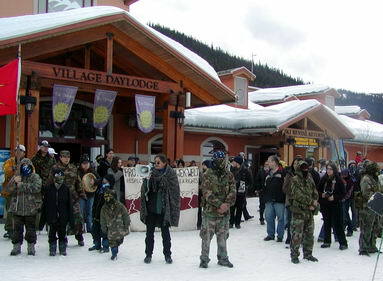 On 18 March 2007, Secwepemc activists and their non native supporters held a gathering and press conference at the Sun Peaks Resort (left) and Delta Hotel (below). Many of the protesters wore camouflage masks "to symbolize the colors of Mother Earth that we show our Alliance with. 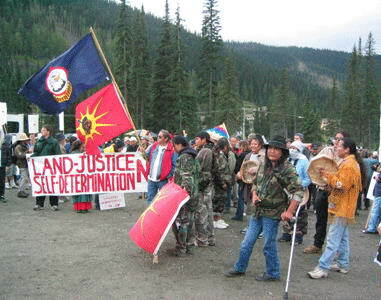 We are speaking for those who cannot be heard, the trees, animals, sky, water, and all life on the land, which also depend on our Sacred Mountains ... "
Delta Hotel protest, Sun Peaks, 2007. 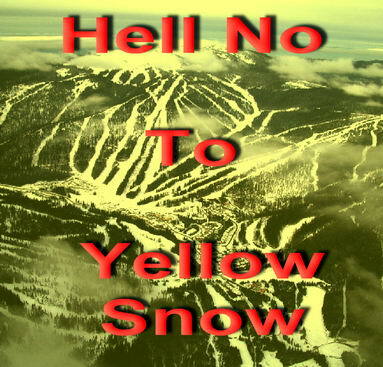 "Hell No To Yellow Snow," 2006. The government and Sun Peaks are using the Austrian Ski Team to promote the sale of real estate at winter resorts in BC which are built on stolen indigenous land. According to Secwepemc activist Arthur Manuel; "Canada voting against the United Nations Declaration on the Rights of Indigenous Peoples at the UN Human Rights Council and at the UN General Assembly are directly linked to what is happening at Sun Peaks. I know that Canada does not want to recognize our Aboriginal Title and do not want to coexist at Sun Peaks. Canada and British Columbia want to have 100 percent of all power over our Aboriginal Title Lands. 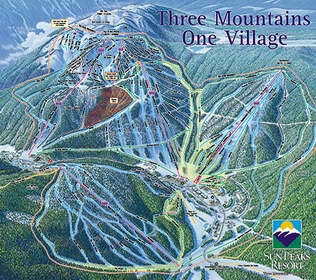 They want to expand Sun Peaks from 4,000 bed units to 24,000 bed units. They do not want to listen to the recommendation our Elders made that Sun Peaks does not have the right to expand" Sun Peaks - Indian Land For Sale. 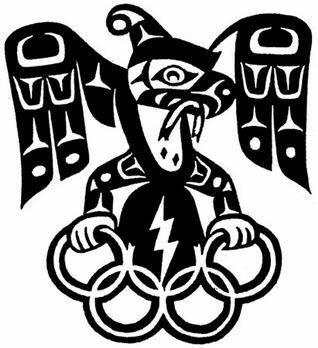 On 8 April 2006, during the Canadian Masters Alpine Championships at Sun Peaks, the Secwepemc Native Youth Movement kicked off a campaign to "Cancel the 2010 Winter Olympics." Visitors were asked to boycott the resort as a way to send a message to the Austrian Olympic Ski Team not to train at the contested First Nations site. The Secwepemc do not want their mountains clearcut for ski runs, their lakes destroyed and their underground aquifiers drained and polluted. "These mountains and the surrounding area are sacred to our People. We stand united to protect this area and are adamantly opposed to the use of what Sun Peaks calls 'recycled sewage effluent' to make snow for ski runs" Secwepemc Native Youth Movement: Hell No To Yellow Snow. Anti 2010 Winter Olympics symbol. 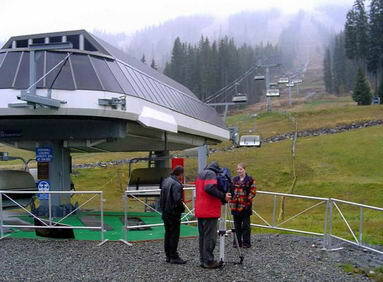 Austrian film crew at Sun Peaks, 2004. 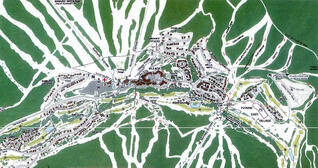 The Japanese company Nippon Cable purchased Sun Peaks as a 400 bed ski resort in 1992. Ever since it has expanded its ski runs and facilities in defiance of Secwepemc opposition. In 1997, the government approved a 24,168 bed expansion and in 2004 further development plans were approved as part of the Vancouver 2010 Winter Olympics. Secwepemc activists and their supporters have organized several rallies at the village of Sun Peaks demanding justice and the resolution of Aboriginal Title. 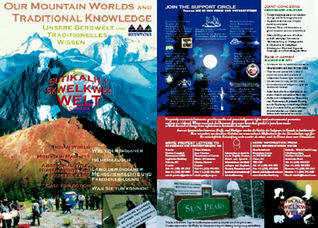 See the 2004 video from BC's Working TV: Sun Peaks Convergence. Enormous all season recreational resorts are a destructive form of industrial tourism. 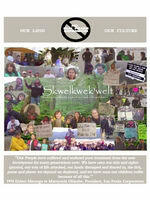 Sun Peaks has had a devasting environmental impact on Skwelkwek'welt. In European countries, laws exist to protect fragile alpine habitats and communities from development. By contrast, at Sun Peaks the Austrian firm "Doppelmayer" installs its ski trams with no regard for the Secwepemc who live off the land by hunting and gathering and for whom such development causes deprivation (left). "The UN has declared 2002 the International Year of the Mountains. This falls into the heart of the International Decade of Indigenous Peoples. Many indigenous peoples live in mountain regions. 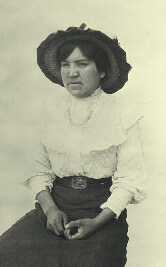 Among them, the Secwepemc Peoples of the Plateau who call the Interior of BC their home. The highly sensitive alpine ecosystems here are the spiritual, economic and cultural focus of their lives. Together they are fighting for the protection of their mountains from destructive mega projects. 2002 has also been declared the International Year of Ecotourism. Tourists see ecotourism as an alternative to mass tourism yet for indigenous peoples, it is often just another excuse for the invasion of their territories. The BC government gives away rights to Aboriginal Title lands to non Aboriginal investors, who engage in real estate speculation" Our Mountain Worlds. Sun Peaks Resort bulldozed a massive road through unceded Secwepemc land without consent (left). Forests on three mountains have been clearcut logged to develop the resort, ruining the habitat of wildlife such as deer, moose, bears, beavers, lynx, bobcat, cougars and wolverines. Native plants that provide traditional berries and medicines for the Sepwepemc have vanished and lakes that are a precious water resource have been polluted by chemicals used to maintain golf courses and make artificial snow. Adding insult to injury, Sun Peaks Resort was rewarded for destroying the fragile mountain habitat with its ski lifts and urban infrastructure. The pro big business BC government gave the company title over Crown (publicly held) land. Unceded Sepwepemc land can now be sold to real estate speculators and be developed (below). Sun Peaks was given a "master lease" by the government, which exempted the corporation from all environmental and social impact assessments. The Secwepemc gain nothing from this exploitation of their traditional hunting and gathering grounds. Not much has changed since 1911 when Secwepemc chiefs protested: "They let us use a few inferior spots of our own country to live on, and say we ought to be grateful to them for giving us such large places. They made some roads of various kinds for themselves, and say we ought to be grateful for being allowed to share in the use of them. We ask is this the brotherly help that was promised us in early days, or is it their compensation to us for the spoliation of our country, stealing of our lands, water, timber, pastures, our game, fish, roots, fruits, etc., and the introduction of diseases, poverty, hard labor, jails, unsuitable laws, whisky, and ever so many other things injurious to us?" Memorial to Frank Oliver. 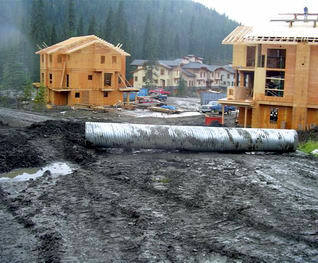 Sun Peaks condos, Skwelkwek'welt, 2004. "No Indians Allowed Beyond This Point." 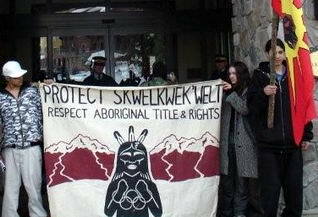 Royal Canadian Mounted Police enforce court injunctions to prevent the Secwepemc from occupying Skwelkwek'welt. For the Secwepemc, the Sun Peaks Resort developers and their government lackeys are engaging in the politics of genocide. See: I Take This As Genocide. 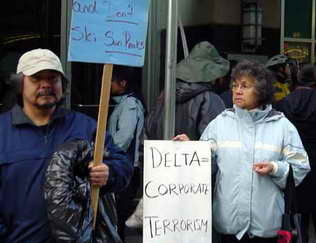 In February 2005 Secwepemc activists held a protest demonstration in Vancouver against the invasion of the transnational chain Delta Hotels at Sun Peaks (right). Westin Hotels at Bear Mountain is another example of corporate abuse. See subchapter: SPAET. "Let's be clear: this is not about a ski hill. It is about a plan to build a small city in the mountains, a place for urbanites to have a weekend getaway - and for developers to make a killing on real estate. Let's be clear about something else: the massive expansion of the Sun Peaks Resort is an act of violence. British Columbia's First Nation peoples have already been robbed of so much. It is the duty of all Canadians living on stolen land to join in the struggle to defend what is left" 16 July 2003, Naomi Klein, The Olympics Land Grab. "Delta = Corporate Terrorism," 2005. 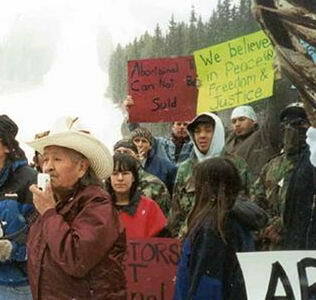 Wolverine (right) at Sun Peaks protest, 2001. The BC premier hosted the annual caucus meeting of the Liberal Party at Sun Peaks in 2005. 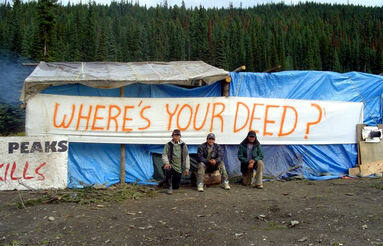 This provocative "business as usual" message to Secwepemc and other First Nations activists. 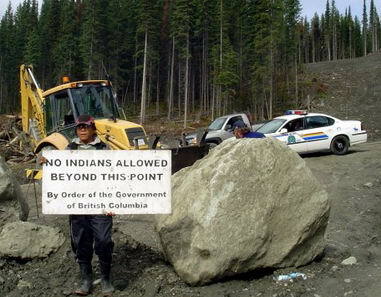 Such unethical exploitation of indigenous territories by government and corporations in BC is the subject of a May 2006 report to the UN Committee on Economic, Social and Cultural Rights by the Indigenous Network on Economies & Trade (INET). See: Independent Indigenous Submission. When the McKenna McBride Commission visited the Neskonlith Reserve on 24 October 1913, they met with Chief William Parrish who said "The first thing I want to speak about is, not to lose my rights on this reserve. I don't want to sell my rights and I don't want to lose my land, and I want to hold it in my head all the time ... and furthermore I want our Chief in our Reserve to have authority as what they call 'The Justice'" McKenna McBride Report. 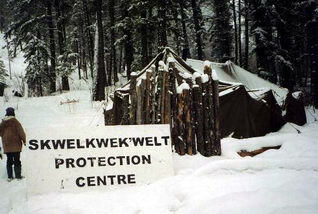 Skwelkwek'welt Protection Centre is part of a long Secwepemc tradition of grass roots activism. 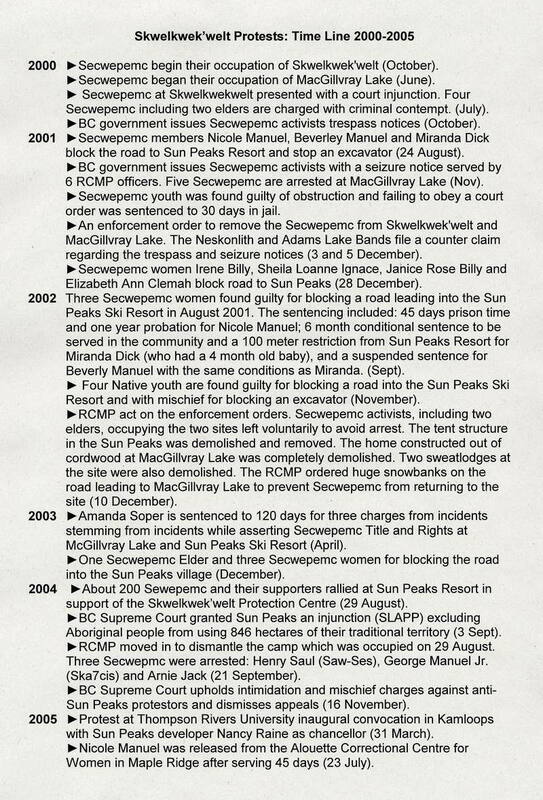 See: Time Line of Secwepemc Protests (2000 - 2005). "Skwelkwek'welt has always been a valuable provider for Secwepemc and as such was surveyed as a Douglas Reserve for the Neskonlith People in 1862. Skwelkwek'welt provides us with a variety of plant foods such as roots, berries, plant stalks, mushrooms and lichens, as well as other foods like deer, moose, fish and birds. We use this land to gather medicines, practice our spiritual traditions, and collect basic necessities for life. With ongoing urban and rural encroachment, Skwelkwek'welt is one of the last places in our territory where we can still hunt for food, gather medicines and continue to practice other Secwepemc cultural traditions. This area is particularly important for our children and youth who have been continually learning, practicing and returning to many of our Secwepemc cultural practices, many of which are dependent on our access to and use of our land" Skwelkwek'welt Protection Centre. Kanahus Pellkey and her son, 5 May 2003. Another Secwepemc NYM activist is Ska7cis (right). On 31 March 2005, he and others protested against the inappropriate installation of Nancy Greene Raine as the first chancellor of Thompson Rivers University in Kamloops. As a former Olympic ski champion, Raine uses her sports status to align herself with big business and promote ski resort expansionism in BC. She is the owner of Cahility Lodge at Sun Peaks and her company (NGR Resort Consultants) is the developer behind the proposed Cayoosh Creek Resort, also located on contested Indian land. This "hot land" north of the Whistler ski resort is in St'át'imc Territory and is being defended by St'át'imc activists. See subchapter: Sutikahl. "KKKanada's Solution to the Indian Problem is to Imprison us, cage us up, impoverish us with legal fees, frame us with criminal charges, and eventually kill us" Native Youth Movement (NYM). In 2001, Secwepemc youth formed a Secwepemc Chapter of NYM as "a warrior society whose main purpose is to defend and protect Indian territories, people and our way of life." One of its founders and spokespersons is Kanahus Pellkey. 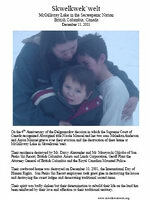 She was jailed on 23 February 2003 for her peaceful occupation of Sun Peaks. After suffering 120 days of incarceration she was reunited with her seven month old baby on 5 May 2003 (left). All legal charges against her were later dropped. Ska7cis and his son, 2005. 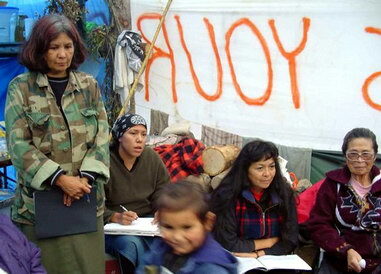 Janice Billy (left), Skwelkwek'welt spokesperson, 2004. According to Janice Billy "It is important to explain that by erecting and maintaining the Skwelkwekwelt Protection Centre our people are collectively exercising their proprietary interest in their traditional territories and protecting our traditional lands for future use. This has been recognized bythe Supreme Court of Canada in the 1997 Delgamuukw Decision as Aboriginal Title. On December 11th, 2000, the Third anniversary of the Delgamuukw Decision we therefore held a demonstration in front of the Vancouver stock exchange to put potential investors for the Sun Peaks Ski resort on notice about our proprietary interests" Sun Peaks Protest: Background (Turtle Island Native News). "The imprisonment of our people is just one of the many immoral tactics used by the British Columbia provincial courts, government, and corporations to continue the theft and destruction of our unceded lands. Rather than deal honorably with us, the government uses the RCMP, courts, and media to carry out their theft and destruction. The young people jailed have shown tremendous courage to stand up to this oppressive and racist system" (Janice Billy, Skwelkwek'welt Protection Centre). Good news came on 27 March 2007 when the BC Court of Appeals reversed two previous court rulings against Nicole Manuel and Beverly Manuel. They were convicted in 2002 for taking part in a 2001 roadblock at Sun Peaks, a conviction that was upheld in a court appeal in 2004. The 2007 judge took into account the testimony by Nicole Manuel "that her understanding of the laws of her people, which she described as 'natural laws' and the 'laws of the Creator,' imposed a duty on her and her people to take care of and preserve the land." 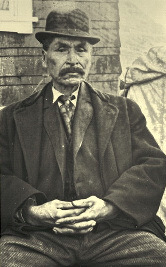 The judge also acknowledged that the 1862 agreement between Chief Neskonlith and British Governor James Douglas was the basis of a 1996 land claim for the recognition and re establishment of the Neskonlith Reserve Agreement. See: Regina vs Manuel (2007). Sexqeltqin elders Wolverine and Irene Billy. "I was very young. When I was growing up we only spoke Secwepemctsin, no English. When I got to the school, the priest and the nuns were there. The school was very big; it looked very big because I was small. 300 children were there. I heard before I went to the school that I couldn't speak Secwepemctsin anymore; that we would have to learn to speak English. But I only spoke Secwepemctsin at home. When the nuns heard me speaking Secwepemctsin, they took us and we were whipped with a strap and ruler. We had to stand in the corner" Land of the Shuswap. 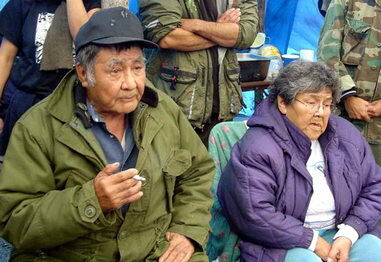 Wolverine and Irene Billy are Secwepemc traditionalists from Sexqeltqin, known as the Adams Lake Indian Band (left). 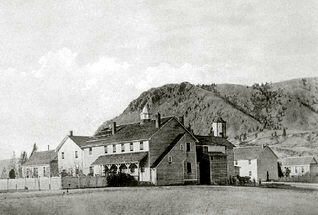 Both are survivors of the Kamloops Indian Residential School (below), which was established in 1893 and operated until 1977, leaving a profound and negative impact on the indigenous people and their communities. "The school began as the Kamloops Industrial School and its purpose was to Christianize and civilize the Secwepemc. 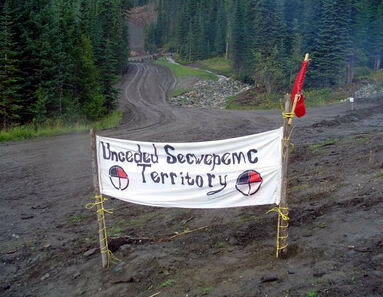 The school worked with the federal government of Canada to colonize and assimilate the Secwepemc" Land of the Shuswap. 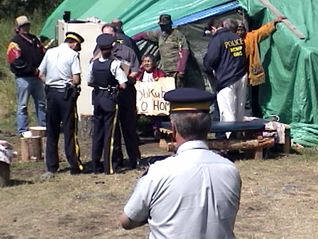 RCMP arresting elder Irene Billy, 7 July 2001. Arthur Manuel says about the RCMP interogation and arrest of Adams Lake Band elder Irene Billy in 2001: "You may be able to use your police to grab and handcuff our elders, land users and youth and haul them away. But you will not be able to keep them away from our land. They will return and all our people will return." Government and big business bribes to impoverished First Nations communities are a deplorable device by which to continue the encroachment of Secwepemc Territory. But such crude divide and rule strategies will not succeed in stopping the Secwepemc from fighting for their self determination as indigenous peoples. 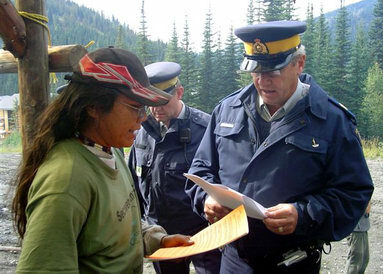 On 7 July 2001, elder Irene Billy was arrested at Skwelkwek'welt by the Royal Canadian Mounted Police (left). 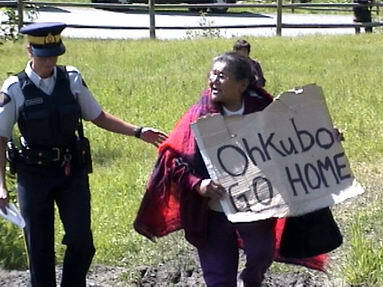 See video: Ohkubo GO HOME (1.3MB). Three years earlier, in 1998, Irene Billy and other Secwepemc elders had written a protest letter to Masayoshi Ohkubo, president of Sun Peaks Corporation: "Our People have suffered and endured poor treatment from the non Secwepemc for many generations now. We have seen our Title and Rights ignored, our way of life attacked, our lands damaged and fenced in, the fish, game and plants we depend on depleted, and we have seen our children suffer because of all this." Arthur Manuel and Irene Billy, 3 September 2004. In an expression of solidarity, on 2 May 2003 Rodolfo Stavenhagen, Special Rapporteur of the United Nations High Commissioner for Human Rights in Geneva, visited the Skwelkwek'welt Protection Centre. See German support actions: Raus aus Indianerland! and Stopp Sun Peaks. 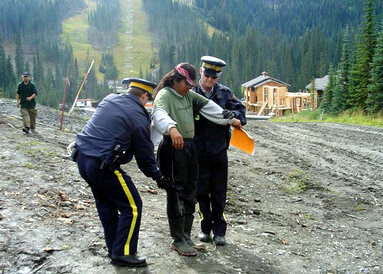 On 3 September 2004, the British Columbia Supreme Court rejected the appeal of eight Secwepemc activists convicted of public mischief and intimidation for setting up roadblocks in 2001 at Sun Peaks. The court ruled that they did not possess a legal and traditional right to defend their territory despite never having relinquished it to the provincial or federal governments by either land claim or treaty. 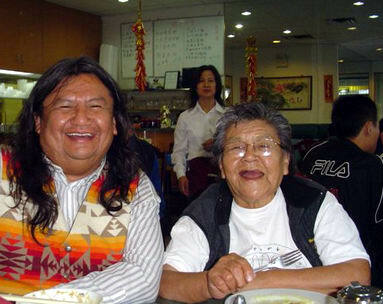 After losing their court appeal, Arthur Manuel and Irene Billy enjoyed a meal at the Nancy Wonton Restaurant in Vancouver, undeterred and undaunted (left).